Flubenvet 2.5% poultry wormer is a medicated feed supplement commonly used to worm chickens, turkeys and geese. It is not licensed for use with ducks although many people do use it. Our page on worming chickens and other poultry provides lots of information about worms and worming and there is separate information on Worming Ducks here. Flubenvet Intermediate (shown in the photo) is active against mature and immature nematodes (commonly known as worms) of the respiratory and gastrointestinal tract. There are 3 major worms that usually affect chickens – these are roundworms, gapeworms and tapeworms. Birds that are suffering from large worm infestations will look ruffled and their combs and wattles will go pale and they can look as if they have little or no flesh on the breast. Another common sign of worms in chickens is a messy bottom. 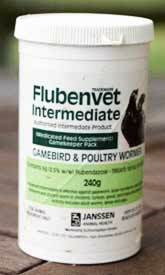 Flubenvet contains the active ingredient Flubendazole which has no adverse effect on egg laying or hatching. 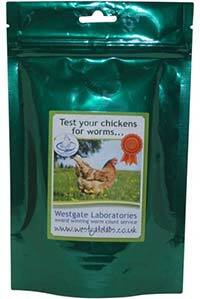 It is the only licensed in feed wormer for chickens currently available in the UK. It is very effective and can prevent a large number of problems and long-term damage to your birds. You do not need to withdraw eggs for consumption when it is given at the correct dose and it is simple to administer in food. The newer Flubenvet 1% Premixture is more suited to hobby poultry keepers. It comes with a handy scoop for measuring out the right quantity and a pack can treat approximately 20 chickens (large fowl). There is separate information about Flubenvet 1% 60g tubs here. It is better to buy the 1% premixture unless you have a large amount of birds to treat as you don’t need accurate weighing scales to measure out the required quantity of Flubenvet 2.5% intermediate. Premixed Flubenvet with Layers Pellets is also available in some places – quite simply a bag of feed, ready mixed with Flubenvet. Before you use Flubenvet, I would highly recommend you check to see whether it is actually necessary using a worm count kit (which is very easy to use). You’ve probably heard about antibiotic resistance and the resistance that worms have built up in other farmed animals such as sheep? Well unfortunately it’s the same with chickens. If we over-use Flubendazole (the active ingredient in Flubenvet) then we risk having resistant worms in the future. In a nutshell, a small number of worms might survive treatment and these go on to produce future generations of worms with the same genetic traits. Just like we’ve selected our chickens over the years to get our specific breeds, we are inadvertently selecting worms that are resistant to the wormer! So before you use Flubenvet, please consider checking whether it is necessary with a worm-count kit. Used to treat: Large roundworm, caecal worm, gapeworm, hairworm and gizzard worm in chickens, geese, turkeys, partridges and pheasants. Dosage: Chickens and Geese: 12g per 10kg of feed. Pheasants and partridges: 24g per 10Kg of feed. Turkeys: 8g per 10Kg of feed. Active ingredient: Flubendazole 2.5% (Various other pre-mixtures are also available with different quantities of Flubendazole such as Flubenvet 1% 60g packs). Egg withdrawal for chickens: Nil at this rate. Egg withdrawal for Goose, Turkey, Pheasant and Partridges Eggs: Must be withdrawn for the treatment period plus 7 days. Length of treatment: 7 days. Storage: In tightly closed original container below 25ºC and out of reach of children. A common problem people find with mixing it is getting Flubenvet to stick to pelleted feeds. You can mix the required quantity in a small amount of olive oil first before mixing the Flubenvet with the feed, it will then stick to the pellets. Make sure the pellets are well mixed afterwards. Flubenvet can also be used to treat tapeworm if a vet prescribes it for your birds – usually they will advise 3 doses, 1 week apart ‘off label’ – which means that the vet needs to offer certain advice about the product not being specifically licensed for that purpose. Any vet wanting further advice can call Janssen and get all the information they need about this (contact details at the end of this article). There is some information on how to mix Flubenvet, so that it will stick to the pellets on the Keeping Chickens: A Beginners Guide website – the Flubenvet poultry wormer page. The advice given here is that of the authors and should not be considered as professional advice. Where there is conflicting information, you should always follow the advice of your vet or professional qualified person.